Often in practice we "breakdown" for 10 or 15 minutes and have post players doing their drills at one end and perimeter players doing drills on the opposite end with a coach or assistant at each end. 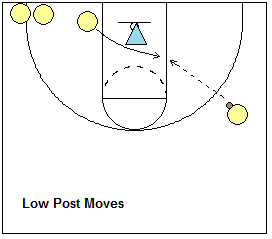 Here are some drills that will help develop the offensive skills of your low post players. Your post players must learn how to "finish" and score against a defender. See the diagram. Have your post players cut from the opposite side to the ballside area a step above the low block. If the post player catches the ball too low on the block, there will be limited spacing for a drop-step baseline move. The coach or manager makes the pass into the low post player. At first, you can have players make their moves without any defense, and then add a defender as seen in the diagram. The post player executes the baseline drop step move (see "Post Moves") and tries to score against the defender. Initially, have the defender allow the drop step move, but contest the shot. You can use an assistant as the defender, or you can rotate your players... offense goes to defense, and the defender goes to the end of the offense line. You might have the defender use a pad and bump the shooter a little to get them used to finishing against contact. cut to short corner, receive pass from wing and shoot. cut to short corner, receive pass from wing, shot-fake, dribble-baseline for lay-up. from opposite block, cut to elbow, receive pass from wing, turn and shoot. from opposite block, cut to elbow, receive pass from wing, shot-fake, dribble for lay-up. Eventually, go "live" with the offensive player permitted to do any of the moves, and the defender playing all out defense. Use the same basic setup as seen in the diagram above. Have a manager, or player not involved in the drill, toss the ball up on the rim. The two post players go for the rebound. The player who rebounds, makes a quick outlet pass out to the coach on the wing, and then he/she immediately re-posts, receives the pass right back from the coach, makes a post move and tries to score. Sometimes in a game, after getting a rebound, a player will force up a bad, contested shot inside, when the better option would be to pass back outside and then re-post... this is what we are trying to teach with this drill. After running the outlet pass drill awhile, go live and let the rebounder make the decision to either power the shot back up, or outlet pass and re-post. This drill features our post players playing "live" 2-on-2. It helps them to learn to play together, to work on reading the defense, beating the defense with a post move, to screen for each other, to box-out and rebound while also working on post defense. See the diagrams below. We have a coach on the perimeter passing into the post players, or receiving the pass back outside. The coach can move from wing to wing. Whenever the defense gets the rebound, they must pass back out to the coach and then they are on offense. The post player can also pass back out to the coach anytime he/she is well-defended. This is also an important fundamental to learn, rather than have the post player just "throw" up a bad shot. We play to 5 and losers do push-ups. In diagrams A - C. we see three situations that can arise that we want them to learn to read. Diagram A shows the defense fronting the ball-side post. The opposite post flashes to the elbow and gets the pass. The low post seals the defender outside and steps to the hoop for the pass and lay-up. In diagram B, the ball-side post defender is playing behind and so we just pass directly into the post. The opposite post moves up to the weakside elbow to allow spacing for his partner to make a post move. In diagram C, the defense is denying the ball inside and so the ball-side post screens for the weakside post, who comes across for the pass. In diagrams D - F, we see one of our post players moving out on top to play "hi-lo". The coach passes to the post player on the top and the low post moves into the lane with an aggressive post-up and gets the curl bounce pass from the top, makes a post move and scores. The low post player here must be aware of the 3-second rule and if he/she does not immediately receive the pass, moves out of the lane, comes back and re-posts. The other option is for the outside post player to fake the pass, and make a hard dribble move to the hoop (Diagram F). When this happens, the low post player should step out to allow spacing for this dribble move. These 2-on-2 drills are competitive and fun for the post players. And the coach can stop the play at any time to teach. The first two drills are done with only one player. So the player can do these anytime, alone. The first drill is the classic "Mikan drill", which gives the player a feel for how the ball reacts off the glass and improves his/her "touch" under the basket as well as footwork. The second drill is "Roll and Retrieve, Power Lay-up drill". Do this drill right under the basket. Become familiar with how the ball comes off the backboard, and at different angles. Start by standing right under the basket. Step on the left foot and do a baby hook lay-up on the right side, using the backboard. Catch the rebound and step on the right foot and do the baby hook lay-up on the left side using your left hand. No dribbling is allowed. Repeat this continuously alternating right and left sides for a couple minutes. This will help you with your lay-ups, both right and left-handed, and give you a better feel for the backboard. More advanced players can then progress to the Mikan drill doing reverse lay-ups, and eventually to the 2-ball Mikan drill. In this drill, the player has the ball at the right elbow and rolls it on the floor toward the right low block. He/she runs after the ball, retrieves it, squares up to the basket, makes a pump fake, and makes the power lay-up, or bank-shot off the glass. Make ten shots on one side and then repeat the drill on the left side. The following drills are done with three players. Diagram A shows the set-up for the next three drills. Do each of these drills for one or two minutes and then rotate players, so that each player gets a chance to perform the moves. Player #1 starts under the basket. He/she sprints out, jump stops, and retrieves the ball lying on the left block. He/she makes a head-shoulder fake toward the lane, and then executes the drop step move by extending the outside (right) leg toward the baseline and pivoting. He/she makes a one-bounce power-dribble adjustment and powers the ball up off the glass using the left hand. He/she then sprints back under the basket, V-cuts out to the right block, jump stops, retrieves the ball on the right block and does the baseline drop-step move on the right block. He/she continues back and forth from block to block for one to two minutes. Players #2 and #3 rebound and place the ball on the blocks for player #1. After one or two minutes, the players rotate and #2 now does the moves. The same set-up and procedure are used in this drill. This time, instead of making the baseline drop step move, the player fakes the baseline drop step, and drops his/her inside leg toward the lane and hoop, and does the one-handed jump hook move, extending the shooting arm high and keeping his/her body between the ball and the defender. The same set-up and procedure are used in this drill. This time, make the up and under move. Again, the same set-up (Diagram A) is used as in the Drop Step Drill. This time player #1, sprints out from under the basket, jump stops, retrieves the ball, makes a head-shoulder fake toward the lane, pivots on the outside foot and shoots the short bank-shot off the glass. 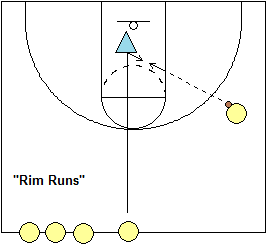 He/she then sprints back under the hoop, V-cuts out to the right block and repeats the move on the right side (jump stop, retrieve ball, fake to the lane, pivot on the left foot, and bank it in). Now work on the step-hop move from the high-post. Catch the pass, make a short drop step to lane along with a one-bounce power-dribble, followed by a long jump landing with a two-footed jump-stop, and then go right up with the shot. 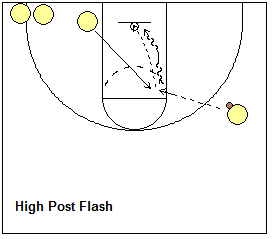 (Diagram B) This drill will simulate contact when going up for the shot. Players should learn to "finish" even when under pressure. In this drill, the ball is placed on the floor, in the lane near the basket, between defenders #2 and #3. Players #2 and #3 extend their arms high over their heads and keep them there at all times. #1 runs in and picks up the ball and puts it under his/her chin with elbows out in a strong position. He/she then tries to power the shot up between the arms of the defenders. The defenders may "body up" and bump the shooter, and may actually hit his/her shooting arm, but may not jump or attempt to block the shot. After a few attempts, rotate players. If you want, you can even include boxing-out and rebounding in this drill by adding the 3-Man Rebounding Drill after each shot is taken. We have our post players start on the opposite low block and then flash cut to the ballside elbow, and receive the pass from the coach (on the wing). First, we do our "pinch and go"... catch, pivot and quickly attack the hoop for a lay-up. The first step is key and we want players to get to the hoop with just one dribble at game speed. Next, we have our players catch, pivot and face the defender, jab-step and shoot the elbow jump-shot. Sometimes it's hard to get open on the low block (e.g. vs a 2-3 zone defense), or your post defender is taller than you, or is a good shot blocker, and you can't effectively score inside. In this situation, take your defender away from the hoop where he/she is less comfortable. Most "bigs" like to stay in their comfort zone near the hoop on defense. Pop out to the short corner, get the pass there, and hit that medium range jumper. Then next time, when the defender moves out to defend you, shot fake and drive the baseline to the hoop for the lay-up or reverse lay-up (using the basket to help protect against the block from behind). First have post players, start at the low block, pop out to the short corner, receive the pass from the wing (coach or manager), and shoot the jump-shot. Do this on both sides. Then do the same drill, except this time the post player makes a shot fake and a quick baseline dribble move for the lay-up. In transition, we want our first post player up the court to sprint to the paint, get open, and look for a quick pass and a chance to score before the defense gets set. In this drill, our post player starts at half-court and sprints to the paint, and then finds and steps into the defender. Then he/she seals the defender and receives the pass from the coach (on the wing), makes a post move and scores. and Steve Wojciechowski, head coach at Marquette University, former Duke University Assistant Basketball Coach.